Historically, the housing market isn’t nearly as volatile as the stock market is. But housing bubbles eventually burst and as we’ve seen in recent years, recovering from a housing crisis can take time. Rising home values allow homeowners to build equity in their homes. But stable growth is generally considered to be better than a rapid rise in prices followed by a crash. 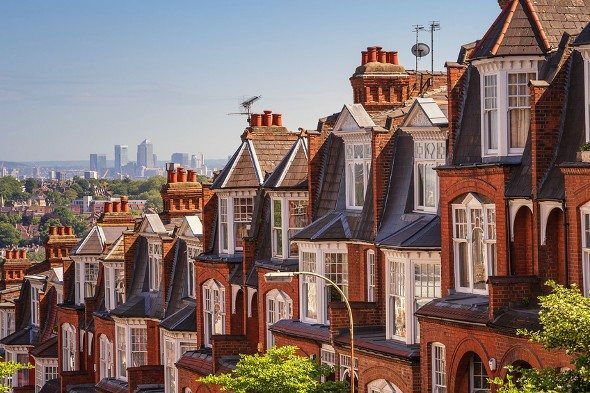 SmartAsset took a look at historical price data and ranked the best housing markets for growth and stability. This is the second annual version of SmartAsset’s study. Read the 2015 version here. To find the housing markets with the most stable growth, we pulled the home price index for single-family homes in the 358 largest urban markets. Our data came from the Federal Housing Finance Agency. We focused on homebuyers who had purchased homes at any point between the first quarter of 1991 and the first quarter of 2016. In order to complete our analysis, we relied on two factors: the overall home price growth rate since 1991 (our growth factor) and the average odds that a homeowner in a particular market would have experienced significant price declines within the decade after buying a home (our stability factor). In order for a price decline to be significant, home prices in any quarter within 10 years had to fall by at least 5% relative to the original home price. We calculated both metrics for each of the housing markets in our study. Then, we gave each housing market a raw score between 0 and 100 for each of our two factors. A metro area with a 0% historical probability of significant price declines scored a 100 for our stability metric. And any metro area with a 53% probability of significant price declines (the highest possible odds in our analysis) scored a 0. Similarly, a metro area with an overall price growth of at least 300% scored a 100 in terms of our growth metric. And a metro area with 0% growth scored a 0. Finally, we created our ranking by averaging the scores for both factors and creating an overall index (giving half-weight to each factor). Buying a home? Find out how much house you can afford. Colorado’s crushing it. Three of the top 10 metro areas with the most stable growth are located in the Centennial State. Once again, the housing market in Boulder takes the No. 1 spot on our list, with a 308% overall growth rate since 1991. Westerners have the upper hand. Our 2015 analysis revealed that five of the housing markets with the most stable growth were located in the West. 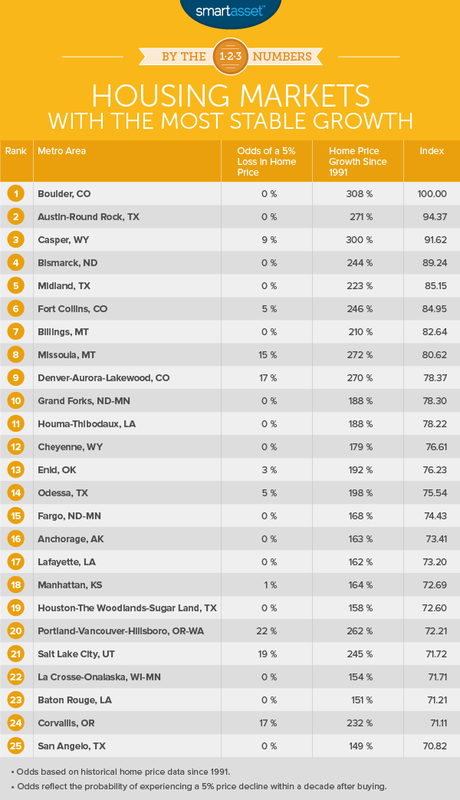 This year, six Western metropolitan areas made the top 10. Plus, three Western markets haven’t faced any significant price declines in the past 25 years. For the second year in a row, the Boulder metro area ranks as the housing market with the most stable growth over the past 25 years. According to our 2015 analysis, the average homeowner in Boulder hadn’t suffered any significant price declines since 1991. So far, that hasn’t change and the metro area has the highest average home appreciation of any city in our study for 2016. Not much has changed since last year in the Austin-Round Rock metro area either, particularly in terms of housing market stability. While home prices took a bit of a dive following the housing crisis, they’ve managed to recover and continue to rise (since 1991, they have increased 271%). And since Austin ranked as one of the best cities for new college grads, it looks like the area is a great place for homeowners and recent graduates. 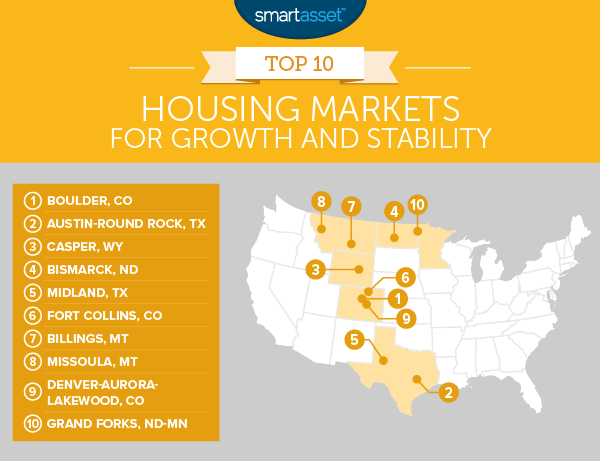 The Casper metro area is another familiar spot to our list of housing markets with the most stable growth. It remains in the top 10 and since 2015, it has moved up in our ranking, even though its total growth rate dipped a little. The overall growth rate since 1991 is now 300%, which is 6.2% lower than what it was last year. But compared to the housing market in Cheyenne, Wyoming – which has only seen home values climb 179% since 1991 – Casper’s housing market seems to be in pretty good shape. Our analysis shows that the housing market in Bismarck has barely seen any shifts since 2015. Although home prices remain high, they seem to be stabilizing. For real estate agents and others who’ve paid close attention to the market, that’s probably interesting given the fact that prices were rising rapidly for years. In the past 25 years, the Midland metro area hasn’t experienced any periods of significant price declines. And since 2015, its overall growth rate has remained fairly stable. A relatively strong economy accompanies the area’s stable housing market. As of April 2016, the unemployment rate in Midland, Texas was 4.3% according to non-seasonably adjusted data from the Bureau of Labor Statistics. That’s slightly lower than the national unemployment rate of 4.7%. 2014 data from the U.S. Census Bureau says that there are about 311,435 people living in the Fort Collins metro area. Employees there work in several different industries, including manufacturing. And its tech industry seems to be growing thanks in part to opportunities provided by Colorado State University. Meanwhile, home price growth has been fairly steady. On average, homeowners had a 5% chance of seeing their home values decline by 5% if they bought homes at any point in the last 25 years. Trying to decide whether to buy or rent isn’t always easy. Fortunately, there are tools available to help you make the right decision. If you’re thinking about buying a house in Billings, it may help to know that the average homeowner has never experienced price declines of 5% or more since 1991. And within that same period of time, overall growth has been more than 200%. Missoula is another metropolitan area in Montana known for having a housing market with a strong potential for growth. Home prices have climbed 272% in the past 25 years. But compared to the other metro areas in the top 25, Missoula is one of the few places that has dealt with some significant price declines over time. Considering a move to Denver? As you weigh the pros and cons of purchasing a home in the area, it’s important to take multiple factors into account. While there has been a 270% total growth rate since 1991, the Denver-Aurora-Lakewood housing market – much like the one in Missoula – has seen home prices drop significantly at times during that period. The Grand Forks metropolitan area is a college town that’s home to roughly 102,449 people. Much of its economy still remains dependent on agriculture and two of its other leading industries include aviation and manufacturing. In terms of its housing stability and growth, conditions for homeowners have improved since we conducted our study in 2015. Prices have increased 188% since 1991.